Mayor Tim O’Brien has announced the City of New Britain will hold an unveiling ceremony for Alton Brooks Way to honor DTC member and community leader Alton Brooks. The ceremony will be held Wednesday, November 28th, at 1 pm at the corner of Osgood Avenue and Slater Road near DiLoreto School. The new street stems from development of the Pinnacle Heights area where construction of businesses and a school is underway. A reception will immediately following the ceremony at City Hall, 27 West Main Street at the Mayor’s office. RSVPs are requested to 860-826-3303. 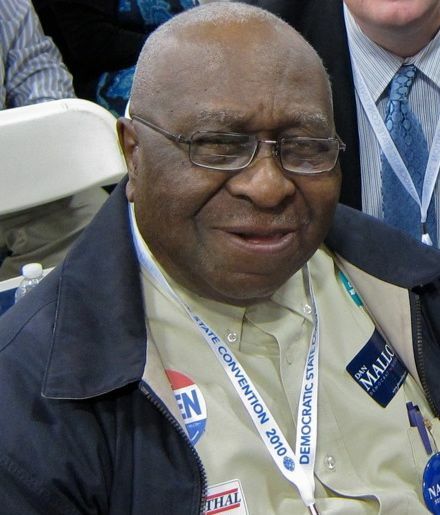 Brooks, 90, is one of the most active DTC members and continues to be a tireless activist for civil rights,youth employment and economic justice. On Election Day November 6th– as is his routine — Mr. Brooks was checking in at headquarters, calling his own list of voters and friends throughout the day and giving rides to those who needed one. The Democratic Town Committee will meet Thursday, November 29th at New Britain City Hall’s Room 504. The meeting begins at 7 p.m. On the agenda: committee members will recognize our winning slate of candidates in the November 6th election and plan for a second inaugural party. All are welcome. The New Britain TRIAD and the Ladies Ancient Order of Hibernians are teaming up this holiday season to help needy families and are accepting cash contributions for their Christmas toy and clothing drive. Families with small children and sponsored by a municipal social service agency can receive toys or other personal items. The New Britain TRIAD led by Officer Carol Zesut is a non-profit organization linking police, senior citizens and community groups.All donation checks should be sent to the New Britain TRIAD in case of Officer Carol Zesut, New Britain Police Department, 125 Columbus Blvd., New Britain 06051. She can be reached at 860-826-3081. Legitimate concerns about the city’s licensing of absentee landlords (all owner-occupied dwellings are excluded) have been drowned out by a phony anti-government coalition fueled by out-of-town interests and a failed GOP leadership seeking once again to use divisiveness for political gain. The well-publicized and well-financed campaign of distortion is now replete with paid protestors, intimidation of tenants and outrageous lies about the ordinance and who would be affected by it. The absentee landlord lobby frets and whines that if this happens in New Britain, it will spread to other communities. What they don’t want you to know is licensing and fees for absentee owners and investment properties exist from the Redwood forests to the New York highlands as a means of maintaining housing stock and improving landlord and tenant relations. As the following post from NB Politicus noted in early October the absentee landlord law suit flies in the face of similar ordinances in Connecticut and around the country, including laws that go far beyond what has been proposed for New Britain. On October 4th, New Britain’s Common Council adopted new fee ordinances on landlords owning non-owner occupied, multi-unit apartments — policies designed to raise an alternative source of revenue as well as to strengthen anti-blight enforcement in multi-unit housing. The $150 per unit flat fee represented a compromise over an earlier proposal that the Council’s Planning and Development committee left on the table. It will raise an estimated $1 million on rental properties with absentee owners. A second ordinance known as a “hot-spot fee” would charge landlords $500 when emergency and public safety personnel are called to an apartment house five or more times in a year. It is expected to generate another $1 million. The hollow threat of a legal fight over the modest New Britain flat fee flies in the face of policies and fees that are found in many other communities throughout the country and that have been on the books for a good long time. In Connecticut, for example, Stamford has an annual fee structure on multi-family units tied to housing code enforcement: a $60 fee and $30 per additional unit for three to nine apartments; $75 and $40 per additional unit for 10 to 39 apartments, and; $200 fee and $60 per unit for 40 or more apartments. Sounds doubtful absentee landlords will dump their New Britain properties to buy dwellings downstate. Nor will they pull up stakes and go to places like Gainesville, FL, North Chicago IL, Burlington, NJ, Cedar Rapids IA, Salt Lake City UT, Minneapolis, MN (and many more). They’ll find landlord fees and licenses and charges for rental units in all of them. One other thing municipalities here in Connecticut and elsewhere have as a sensible part of housing policy is a Certificate of Occupancy ordinance. That was lost to New Britain in the 1990s when Tom Bozek was the Council majority leader. It would be a feather in the cap to Mayor O’Brien and the Council to restore the CO ordinance, not just for fees but to fairly handle the rights and responsibilities of landlords and tenants. It’s time to reinstitute the Certificate of Occupancy in New Britain. The Mayor and Common Council have not deserved the insults and push back at the Council meeting from some of the attendees, particularly absentee landlords who need to learn a lesson in shared sacrifice without diminishing a return on their investments. They need to be responsible members of this community whether they live here or not. This entry was posted in City Hall, Housing, Meeting/Event, Municipal Budget, Tim O'Brien. Bookmark the permalink.